A complete list of compatible third-party instrumentation is available here. Mosaic interacts directly with your automated vial-, tube- and plate-stores, requesting the required samples without human intervention. Where possible, Mosaic optimises the retrieval sequence to maximise throughput, while ensuring that downstream processes can still be handled efficiently. The modular architecture of the software allows support for your automated stores (and other workstations) to be added with ease. The Mosaic Manual Stores PDA (personal digital assistant) application provides a high level of guidance for the manual selection of samples in response to orders. 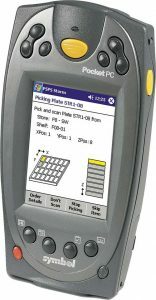 A graphical display provides instructions and diagrams of where the containers are located, and the user confirms the picking operations using the built-in barcode scanner. Where the stores consist of semi-automated shelves (for example of the ‘Kardex’ type) the PDA application can control the selection of the correct shelf. 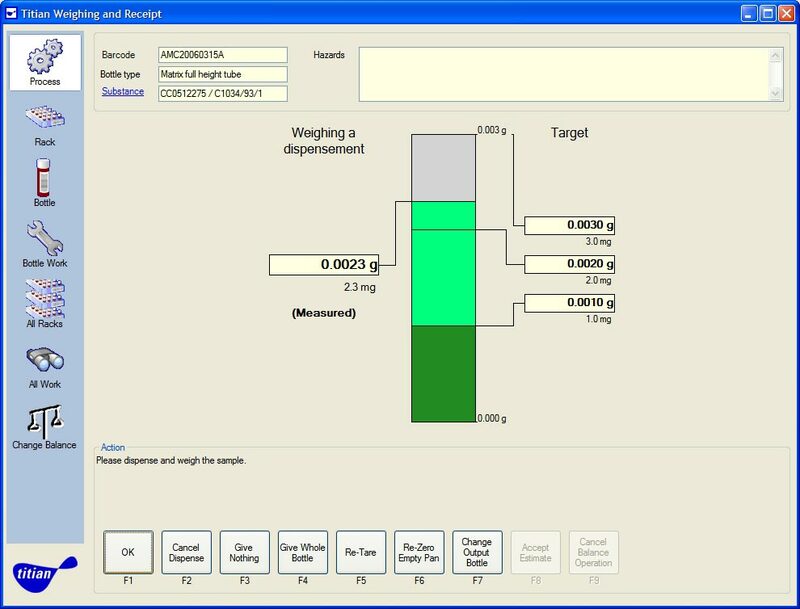 Mosaic Weighing is used to guide operators through an optimised process of dry dispensing, in response to orders and for ad-hoc transfers. Using an integrated electronic balance, a barcode reader and an optional barcode printer, Mosaic provides a graphical interface that provides clear instructions to the user, with step by step processing including tare weighing, dispensing, gross weighing, cap on/off weighing and label printing. Mosaic’s Liquid Handling module closely integrates your workstations into the system. It automatically controls the robotics to ensure that each item is correctly processed, based on the required workflow steps. Machine control scripts and commands are automatically generated, so the set-up of each run takes just moments. Mosaic interfaces with the liquid handlers to get feedback about run results, and automatically records information about inventory changes and workflow progress. Straightforward load / unload / error handling guidance is given to the user, and the software warns if any items cannot be processed at a workstation because of particular process constraints. A robust error handling and recovery mechanism is employed to ensure that faults are recovered from quickly and efficiently. This minimises machine downtime and reduces sample wastage. On recovery from catastrophic events (such as a power outage), the tracking software simply starts from where it left off. Mosaic supports a broad range of tube rack scanner devices, and using the Mosaic Tube Position Verifier application, the user is guided through the process of picking tubes for an order into an empty tube rack. After filling the new rack of tubes, the rack is scanned for the tube positions to be confirmed and for any errors to be displayed. This application can also be used to re-arrange tubes to make best use of racks and storage space, and to update Mosaic with tube positions in the event of the tubes being accidentally removed from the rack. Mosaic also controls some of the popular bench-top tube picking devices using the Mosaic Tube Picker application, providing automated tube picking in response to orders. This is a cost-effective semi-automated solution to cherry-pick tubes, in cases where automated storage of tubes is not possible. Mosaic can track bacterial samples through the stages of culture, plating out for colonies, and subsequent colony picking. Mosaic exchanges data with automated colony pickers to ensure that all steps are recorded, and that derived entities and barcoded containers are created in the inventory. Parentage is tracked, and all steps are recorded in Mosaic’s audit trail.